And oh the rumblings we shall make in our corner of the world! I hope to add to this blog a couple of times a week so here is my disclaimer right here and now. Sometimes life just happens too fast and I cannot seem to get off that fast track and find time to blog. Honestly I have questioned myself pretty hard over this because why should I write a blog which would add another thing to my ridiculous to do list. And if that was not enough of a reason not to write then there is the glowing ember in the back of my mind that there are many, many great established bloggers that know more, do more, and write way better than myself. And horrors darling should one of my English teachers ever stumble through cyber space and find my ramblings I would be banned from blogging! In conclusion I have decided to overcome all of those stumbling blocks and blog on! With that said the title of this blog somewhat defines what I plan to share with you and I do sincerely hope that you will find some little gem of truth, or perhaps a word of encouragement to help you in your plight of being a mama! Congratulations my friend! You did it!! Woohoo! Welcome to blogland! 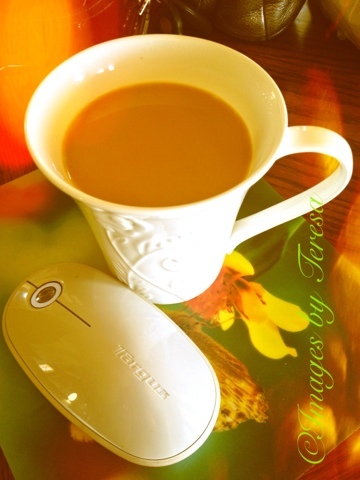 Absolutely LOVE this picture of your coffee and mouse! I am TRULY looking forward to your ramblings as I KNOW that there were be great treasure and truths to be found here! Thanks Valerie for stopping by! Olivia liked the pic too and just looking at it makes me want to drink another cup. We shall see how this goes!